We’ve all heard the tragic stories about parents who just look away for one distracted second while disaster strikes their helpless toddler. There’s the kid who got into the gorilla enclosure at the Cincinnati zoo, or the children in Texas who drowned while their mother was occupied with her cell phone. When I think about the damage that is being done to our society by the latest evolution of our gun culture, I can sympathize with those parents. I’m not a gun aficionado, but, for a long time, I felt that settling the 2nd amendment questions about gun ownership weren’t my first priority when it came to political activism – at least not in a society where we have had to fight every day to defend the economic and social progress we made in the 20th century. Social Security, reproductive rights, civil rights for minorities – all came before guns. Guns, after all, just didn’t seem like that big a deal. When I was a child and we were living in a rural area, my father owned an old shot gun that was kept, unloaded, in the back of a closet. It was only used once that I know of, to stop the suffering of a pet dog that had been too badly badly mauled by coyotes to survive. Later, when we moved to a small city, few, if any, of our urban neighbors had guns, or, if they did, they were securely locked away and nobody thought much about them. So who cared if a few nuts were hot and bothered by the 2nd Amendment? Like those distracted parents, I looked away. When I looked back again the disastrous view took my breath away. There are more than 300 million guns in circulation – in a country of 300 million people – although only about a third subscribe to gun ownership. In 2015 there were 372 mass shootings (i.e., four or more individuals shot) , which killed 475 people and wounded 1,870. Overall, excluding suicide, 13,286 people were killed in the US by firearms in 2015, and 26,819 people were injured. And make no mistake, this is an American phenomenon. In the U.S. 60% of all murders in 2015 were the result of gun violence, while only 31% of the murders in Canada, 18.2% in Australia, and just 10% in the UK were attributable to guns. I should add that Canada, Australia and the UK all have strict gun regulations. This means that anyone in my neighborhood could be packing at any time. Couple this fact with a Missouri law awaiting the Governor’s signature that would extend stand-your-ground, and any paranoid lout or half-drunk old geezer who is offended by the way I allegedly looked at him, by an overheard conversation, by the political signs in my front yard, or just about anything that strikes his or her fevered imagination as threatening, can be inspired to fire off a few rounds in my direction. The possibilities opened up by concealed carry and stand-your-ground laws do not make me feel safe. They make me instead think about getting out of Dodge. 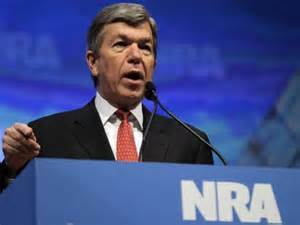 Since 1998, no current member of Congress has accepted more in campaign donations from the National Rifle Association than Missouri Sen. Roy Blunt. A new analysis this week from The Washington Post, and highlighted in the St. Louis Post-Dispatch, showed that Blunt has received $60,550 from the NRA. Go ahead. Guess where Blunt has come down on all the recent efforts to keep military assault weapons out of the hands of civilians – including suspected terrorists. To be fair, Blunt did vote for two GOP-sponsored amendments that pretended to keep suspected terrorists from buying guns while doing nothing or even, according to some calculations, making the gun situation worse. Nothing like pretend government. Maybe Missourians should all just pretend to vote for Blunt next November. Next Post:A MO Democratic candidate calls for a Balanced Budget amendment. Wait, what?